Rendering of what a redeveloped Quayside area of Toronto would look like. Image by Sidewalk Labs. Alphabet Inc.’s autonomous vehicle technology will be a big part of its Toronto project to make urban life more Googley. Sidewalk Labs, a unit of Google parent Alphabet, and Waterfront Toronto unveiled plans to build a digital district in Canada’s largest city. Sidewalk’s official plans filed with the city and released on Oct. 17 include visions of all sorts of robotic transport: driverless bike-like vehicles, larger self-driving vans, robotic delivery and even autonomous trash collection. The Alphabet unit plans to move goods, not just people, autonomously through its digital district. It envisions an “internal robot delivery system” for all businesses and residents in the Quayside area of Toronto, and will seek to expand it further. Plans also include a four-part solid waste system Sidewalk imagines would include a waste hauling system that relies on autonomous vehicle technology, according to the plan submitted to Toronto. The plans show Alphabet’s broad ambition for autonomous vehicles and how CEO Larry Page sees the technology as a key tool for modernizing cities. 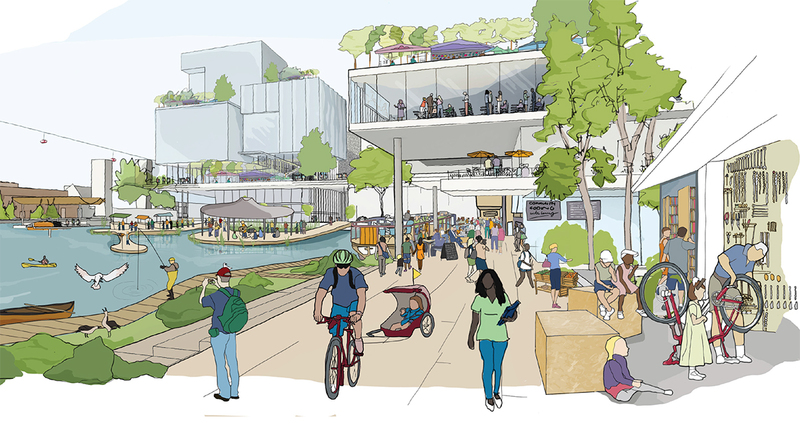 Alphabet businesses are supposed to be independent, but Sidewalk Labs’ plan suggest multiple divisions can still work together on big initiatives. Sidewalk said it will tap partners, including Alphabet’s Waymo, to test multiple types of self-driving vehicles in the Eastern Waterfront area of Toronto. It proposed a van with six to twelve seats for low-density transit routes, and “a personal vehicle more like a bike than a car in size.” A Waymo spokesman declined to comment. Sidewalk Labs said it will work with companies such as Waymo to deploy a “baseline fleet of taxibots and multi-passenger vanbots.” Existing providers, such as Lyft, would be welcome to enter the market, it added. “A key goal of the taxibot system is to use competition to improve user experience, and individuals will be encouraged to include any privately-owned self-driving vehicles in the system as well,” according to Sidewalk’s plan. In the near-term, Sidewalk plans to run a six-to-twelve person autonomous shuttle in the summer in a specific area of Toronto to get residents used to the technology. “Single-person selfdriving vehicles might eventually be integrated into an elevated transport system, such as a gondola,” Sidewalk added.